NASA's New Horizons spacecraft set a major milestone for human space exploration earlier this week. Its approach of Pluto means that every solar body that is now - or ever has been - considered a "planet" has been visited by at least one NASA space probe. The probe was launched in January of 2006 (back when Pluto was still a "planet"), and it will continue out beyond Pluto and into the mysterious Kuiper Belt to continue its exploration of the solar system. In the meantime, the probe has sent back months-worth of high-resolution images and scans for NASA scientists to study. The early results are already full of surprises. 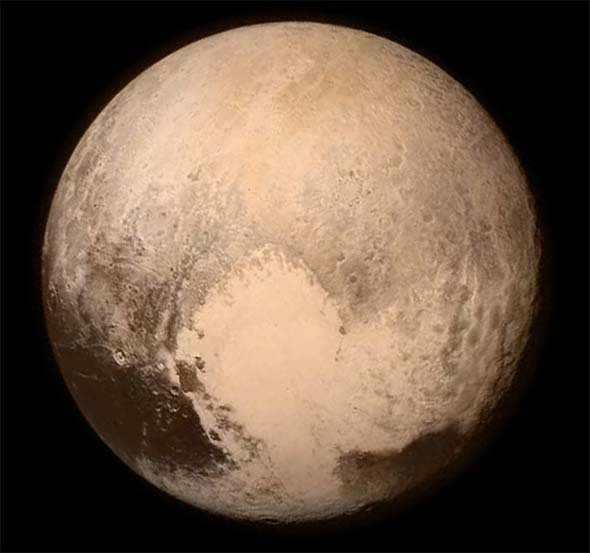 New Horizon's first, high-res photograph of Pluto (July 14, 2015). 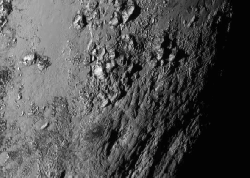 Pluto - it turns out - is not the old, craggy, cratered world that many scientists expected it to be. In fact, it appears quite young, with tall, rocky mountains and nary a single impact crater. This is surprising considering the body's proximity to the Kuiper Belt, which contains numerous asteroids, and other small, rocky bodies left over from the formation of the solar system. Large mountains were found on Pluto. The probe also found possible evidence of frozen water. Frozen nitrogen and methane were expected, but early photographs suggest that frozen water may also make up a large portion of Pluto's crust. This is exciting for scientists because the presence of water (even in frozen ice form) is a possible indicator of life. There doesn't appear to be any liquid water (at least not yet), so the prospects for life are much better on Jupiter's moon Europa (which may have underground liquid oceans warmed by subterranean vents), or Saturn's moon Titan (which has a dense atmosphere and possible liquid surface water). But it at least adds Pluto to the list of possible targets of further study. New Horizons was actually making discoveries long before it reached Pluto. In 2007, it captured video of a massive volcanic eruption on Jupiter's moon Io. It was a pretty spectacular sight to behold. A five frame video of a massive volcanic plume on Jupiter's moon Io (taken in 2007). As an interesting piece of trivia: the New Horizons craft also contains the cremated remains of Clyde Tombaugh, the man who first discovered Pluto in 1930. He had requested that his ashes be sent to space. Not only did NASA oblige, but they send his ashes to the very body that he became famous for discovering. He had died in 1997, and you'd be hard-pressed to come up with a more fitting interment for an astronomer. More information about Pluto and the New Horizons mission can be found on NASA's official webpage at https://www.nasa.gov/mission_pages/newhorizons/main/index.html. A history of the images of Pluto.